two amazing, dreamy psychedelic live act from Italy, both issued on Boring Machine…live this week end in Berlin! Rella The Woodcutter, is an Italian musician and songwriter. He has been associated with the underground ensemble The Rotten Wine Company for many years and released many albums and EPs on a variety of labels exploring different styles, some focused on traditional songcraft, others more experimental, based on a variety of subgenera as drone, free-rock and folk music, as the CD trilogy “Desire, Death and Rebirth/Ode to Makarashyiu/Excerpt from the Blue Bible”. 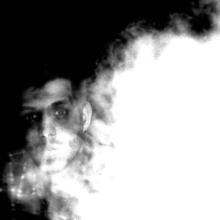 He is also part of Eternal Zio, psych-drone project with Roberto Maggioni, Valla and Maurizio Abate, the latest known for his collaborations with Jooklo Duo and releases from Troglosound Records. A fully devotion and understanding of the song dynamics makes Rella one of the most interesting musicians to continue the tradition that goes from psychedelic folk to blues to more experimental territories. Rella’s singing is rich, intense and perfumed, sometimes plunged into deep trance. Instruments and voice which rise together in a psichedelic unison building from country-like openings or dissolving from a noisy cluster into a static chord strumming. BeMyDelay is the solo project of Marcella Riccardi (Blake/e/e/e, Franklin Delano, Massimo Volume), singer and guitarist. Her interest in archaic blues and adventurous music is the ground for building a song collection which tastes of experimental blues, vocali drones, acoustic pareidolia. BeMyDelay takes the listener to a soft voyage, letting the mind flow gently, a cosmic singalong where melodies come and go circularly, immersed in a muffled and ethereal atmosphere. 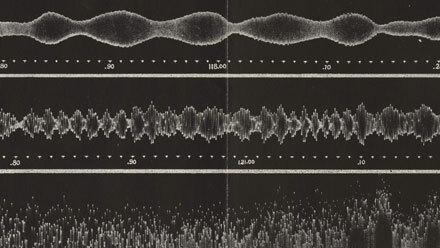 Voice is used as an instrument, following the guitar loops and delays. The new album, entitled “ToTheOtherSideΔ” is based around manipulation of two loop stations, a couple of old wha-wha tibetan bells and some percussions, which togheter with the voice create circular vortex where the mind can loose herself into thousand echoes floating inside the songs. Marcella Riccardi aka BeMyDelay has played and sung with: Blake/e/e/e, Franklin Delano and Massimo Volume. With Franklin Delano she recorded three albums, of which “Like a smoking gun in front of me” (2004, mixed in Chicago by Brian Deck) and “Come Home” (2006, mixed at John McEntire’s Soma Studios and produced by Brian Deck) with the partecipation of musicians like Jim Becker, Ben Massarella, Tim Rutili from Califone, Fred Lomberg-Holm, Nick Broste, Josh Berman and Brian Deck himself. 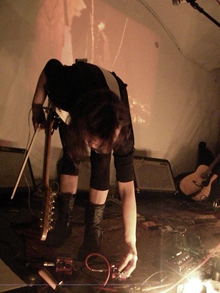 In 2008, with her new band, Blake/e/e/e, she started her collaboration with Vacuum Studio’s Bruno Germano, fine soundmaker and great musician (played with Settlefish among others). Blake/e/e record, “Border Radio”, has been released in US by Freefolk Records and in Europe by Unhip Records. In 2011 she worked again with Bruno Germano to record and mix her new album as BeMyDelay “ToTheOtherSideΔ” which has been mastered by Carl Saff in Chicago. Marcella/BeMyDelay loves to play live and from 2004 until now she played three coast-to-coast tour in US, two european tours and more than one hundred gigs in Italy with her bands or alone. Kraut-psyche as we like night at .HBC on Sat Oct 22th! Damo Suzuki is best known as the singer of German group Can on their LPs ‘Soundtracks’, ‘Tago Mago’, ‘Ege Bamyasi’ and ‘Future Days’. This period exerted a considerable influence on artists such as P.I.L, David Bowie, Brian Eno, Sonic Youth, The Jesus and Mary Chain and The Fall, who released the tribute ‘I Am Damo Suzuki’ in 1985. Much of Can’s output was made through, in Damo’s words, “instant compositions”, a thread which continues in to his current musical incarnation in the Damo Suzuki Network. From 1998 Damo has taken the Network on a ‘Never Ending Tour’, and “sound carriers” have included members of Can, Acid Mothers Temple and Guru Guru among many others. Camera are a Krautrock trio – Michael Drummer (minimalistic drum set: tom, snare, cymbals), Franz Bargmann (e-guitar), Timm Brockmann (keyboard, laptop) – with occasional guest musicians. Up to now there are no recordings, they just want to play. And most of all they play spontaneously and unannounced: on the street and in subway stations, or as unwanted guests at highly official after parties like the German music award Echo or Deutscher Filmpreis, until the security notices they are not supposed to be there and kick them out. But wherever they play, their improvised and minimalistic physical Krautrock always fills their audience with enthusiasm. After two one-sided 12″ vinyl releases (“Tenebroso” on Holidays Records and “Live at Outside Inside” on Xhol Recordings) the first SQUADRA OMEGA full lenght is finally out on Holidays Records in LP+ 7″ format. Squadra Omega is a psych/avant/krautrock collective with former and present members of the Mojomatics, With Love and Be Maledetto Now! devoted to free improvisation, psychedelic jams and mind blow ups. The open line-up change on every track. Members of Squadra Omega gather at their analog shelter – Outside Inside Studio – and this time they definitely walked new paths and reached higher peaks of experimentation.